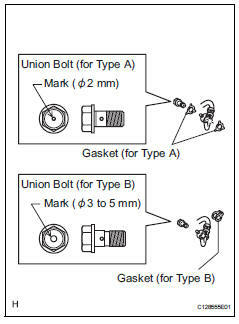 The gasket and union bolt must be used as a set, as shown in the illustration. 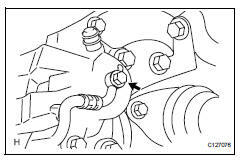 Connect the flexible hose with new gasket(s) and the union bolt to the disc brake cylinder. Install the flexible hose lock securely in the lock hole in the cylinder. 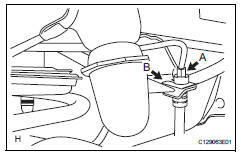 Set the flexible hose to the connecting point with the brake tube (labeled a), and then attach a new clip (labeled b). Using sst, connect the flexible hose to the brake tube (labeled a) while holding the flexible hose with a wrench. Do not bend or damage the brake tube. Do not allow any foreign matter such as dirt and dust to enter the brake tube from the connecting point.